I have been an early adopter of e-books, I have hundreds of them on my Kindle. Electronic format has the huge advantage of transportability. 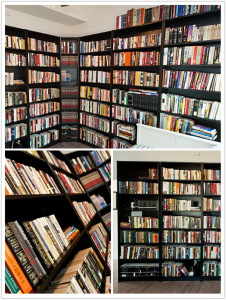 It takes no more room to store hundreds or thousands of books. Reading one of Ryan Holiday’s article made me think of a book I have somewhere in a box, I hope it is not lost. It is a copy of Marcus Aurelius Meditations (Pensées Pour Moi-Même) annotated by my Grand-Dad. Can you imagine anything more precious? Book shelves give a spirit to a house. And they are full of charm!